The best advertisement is a happy Holy Family student/parent! Reviews on various websites, such as Google, www.GreatSchools.org, and Facebook, help promote Holy Family Catholic School. We would greatly appreciate your postive reviews on any of these! This site requires you to sign up, either through Facebook or your email address, and you can go directly to Holy Family Catholic School's page at www.greatschools.org. There are several topics on which you can review the school. 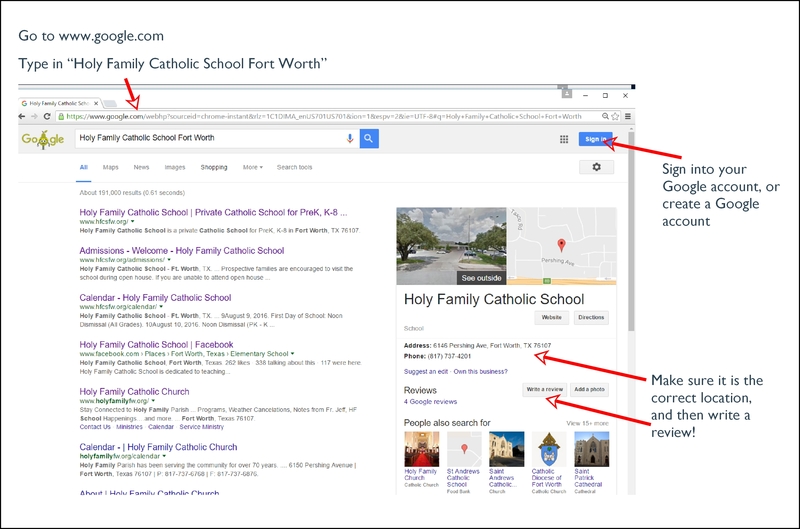 To maintain a position in the top area schools on the organic Google search results, reviews are vital! Click here for detailed instructions. You are required to have a Facebook account to leave a review. Go directly to the Holy Family Catholic School's Facebook Reviews page here.